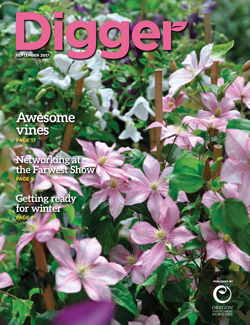 Our September cover feature is on awe-inspiring vines, but there’s lots more to read about in the newest issue of Digger. On the cover: Topping out at about 6 feet, Clematis ‘Caroline’ is perfectly suited for smaller settings, such as urban patios. Its flowers are pale pink with a darker central bar on the sepals. Photo Courtesy of Greenspire.